Establish your outfit of dudes and deeds, prove your tenacity and take control of Doomtown! In Doomtown: Reloaded players take on the role of a western outfit and set out to control the town of Gomorra that’s struck it rich with a unique resource called ghost rock. It’s a game of balance between the control and influence you have in town. During High Noon, building more deeds will give you more control, where hiring more dudes in town will give you more influence. Want to lower your opponent’s influence? Call out one of their dudes to have a shootout. You can chip away at their influence in town or even take control of their deeds. Keeping with the theme of the wild west and poker, shootouts and other elements of the game will involve drawing from your decks to see who has the highest or lowest poker hand. Then at Sundown, if you have more control than your opponent’s influence you win the game. Each player chooses a faction and a deck of 52 cards made for that faction. If you’re new to Doomtown, the rulebook already has a list made up so you can easily create one 52 card deck for each of the four factions and get right into the game. The four factions are: The Law Dogs – trying to keep peace and order, The Sloane Gang – doing just the opposite, The Morgan Cattle Company – big business, and The Fourth Ring – a wild bunch of carnys. Once you’ve played enough rounds to get a handle of the game and your favorite faction, it’s time to dig into the cards and make your own custom deck before the game starts. Next, Each player puts out their home (outfit) card to represent their street in town, and then takes the ghost rock that is shown on that card. With that you can then choose up to five dudes to put into play at your home, paying their cost from the initial ghost rock you started with. Players then shuffle their decks and draw five cards for their “play” hand. Time to start settlin’ and shootin’! This is your faction’s home card that gives you an initial amount of ghost rock (lower-left) to start the game, and then earns you ghost rock (lower-right) during each upkeep phase. It also includes a special ability that you can use, usually once per noon phase. Below we’ll go into detail about each suit, but it’s important to note that every card will have a suit and a value just like a deck of poker cards. Though in this game, even though your deck will have 52 cards, you won’t have every value (A, 2-10, J, Q, K) for every suit. It’s important to know what values you do have, so that when you draw against your opponent you know what you have the most of in your deck. This way, you’ll know what cards to discard so you’re more likely to draw the cards you need to make a higher ranking poker hand. Adding deeds to your street is one of the main ways you’ll gain more control (blue poker chip icon) in town. Deeds usually have a special ability that the controller can use, and then every deed you both control and own will produce ghost rock (lower right) for you during the upkeep phase. Dudes are the main way you’ll maintain influence (red poker chip icon) in town. You’ll be moving your dudes around town to protect your deeds, control other deeds and call out other opponents’ dudes. Be careful to not lose too many during shootouts because loosing dudes usually means losing influence. Also note that the more influential and/or powerful dudes typically have to be paid wages (upkeep) each round (lower right icon). These cards will typically cost you some ghost rock and can then be attached to your dudes to give them bonus stats and/or bonus abilities. These cards get played directly from your hand and then discarded. Many don’t even cost ghost rock to play. They will give you special abilities for different situations and phases during the game to help give you the upper hand. These can be hit or miss to have in your deck. They only help if you draw them when determining a poker hand. When this does happen, you get to choose what suit and rank they are, so this can really boost your poker hand rank. Each round of play consists of four phases: Gamblin’ phase, Upkeep phase, High Noon phase and Sundown phase. This phase determines who will go first during the round. Each player antes up one ghost rock to the pot (or borrows it from the bank if they don’t have any), and then draws the top five cards from their deck with the hopes of having the lowest (worst) poker hand. Whoever does goes first during each phase for that round, and also gets to keep the ghost rock from the pot! Simply collect the ghost rock produced by your outfit card and deeds (that you own and control), then pay any upkeep costs that your dudes require (or don’t, but you’ll have to discard them). You also have to pay the bank back if you had to borrow ghost rock during the Gamblin’ phase. Here is where the game completely opens up. There are five actions a player can take on their turn (described below). The gamblin’ phase winner will start first by performing one action or passing, then going clockwise players continue to perform one action (or pass) per turn until all players have passed, which then ends the High Noon Phase. If a card has a noon ability (noted on the card text) you can pay any required costs and perform that action. A big part of what makes Doomtown stand out in the crowd of CCGs (though officially Doomtown is an ECG – Expandable Card Game) are the multiple locations and movement options involved. Each player has their “street” where their home (outfit card) and in-town deeds are at. Each player’s street is adjacent to the center space called the Town Square. As a movin’ action you can move your dude to these various locations: homes, deeds and the town square. If you choose to move your dudes to adjacent locations they won’t get booted (turned sideways and exhausted). Or you can move a dude to any non-adjacent location, but it will become booted. This action involves spending ghost rock to bring a dude, deed, spell or goods card into play (New dudes enter play at your home). Two dudes that you control that are at the same location (that you also control) can swap goods cards. This is where the action is. If you have a dude at the same location as an opponent’s dude you can call that dude out! If they accept the call out (rather than choosing to high tail it back home), you’ll start a shootout (clear the streets folks!). Without getting into the nitty gritty… In the end, your goal during a shootout is to have a higher ranked poker hand than your opponent. You’ll get to draw five cards from your deck, but you can use your dudes to help you draw additional cards (dudes with a silver bullet) as well as discard and draw new cards (dudes with a brass bullet). In a shootout, players will form posses by choosing other dudes in the same location or adjacent to their dude involved in the call out. You can also use special abilities you may have that allow dudes to join the shootout. Players can then perform shootout abilities if they want/have any. Then it’s time for each player to pick their shooter by choosing the dude that they feel will give them the best drawing benefit. Then both players draw five cards plus any bonus cards from their dudes with silver bullets. Then each player can discard a number of cards based on dudes with brass bullets, and draw new cards. Finally, players discard down to five cards and reveal their hands. Each poker hand has a rank, so depending on how much higher one player’s hand is ranked than the other, that’s the amount of casualties they’ll take. For example, if I had a three of a kind (rank 4), and you had a full house (rank 7), I’d take three casualties. Discarding a dude involved in the shootout counts as taking one casualty, “acing” a dude (removing them from the game entirely) counts as taking two casualties. If there are still dudes left on each side, it’s time to decide if you want to get the heck out of dodge (boot your dudes and send them home), or stay in the fight and have another shootout! Once players have all passed it’s time for Sundown. First you see if anyone has won. If a player has more control in their outfit than the other player’s influence, then they’ve won the game! Otherwise, players may discard one card from their hand and then draw up to their maximum hand size (typically five). Then players unboot all their cards, and start the round at the gamblin’ phase. In the base set you’ll get enough cards to make four complete 52 card decks, and still have plenty left over for customization. You’ll also get plenty of tokens for tracking influence, control and ghost rock, plus some bonus tokens to track other things you might come across with card abilities. You also get two player boards to help you get started with the game, though we’re sure that after you’ve got the hang of things you’ll probably not need them anymore (it’s also easier to play if you spread your street cards out a bit). All-in-all you get your money’s worth and then some! You could play and customize for a long time with just the base set. The box comes with ample room, we’re guessing it could hold 1,000+ cards! High. Some gamers are better at picking games up more quickly than others, but no matter how experienced you are, Doomtown is a very deep game with many actions and strategies you can choose during your turn. And you can’t just keep your head down and play your own game. What you do can and will affect your opponent’s decisions, and visa versa. Luckily Doomtown comes with a very well written rulebook, as well as a tutorial book called “Gettin’ to Know Gomorra.” Right when you open the box, there are two decks set up for you to use alongside the tutorial which will take you step by step through a round of play and introduce you to each element of the game. If you’ve never played the game and don’t have someone to teach you, this is highly recommended. The tutorial book also offers a suggested deck build for each of the four factions, helping you ease your way into deck construction. To help make the play area more clear, the game comes with a board for each player, with spaces for their home card, deeds, as well as an area for the town square. The boards also have useful information on them to help you during the game (like the poker hand ranks and posse creating rules). The game is complex, hence the 14+ age suggestion, but if you have older children that love digging into a deep game, then you might consider taking this for a spin. There are no group parties in Doomtown folks! There is plenty in Doomtown for strategy gamers to enjoy. Everything from all the actions you can perform to the deck construction before the game starts. The movement also adds another layer of strategy. The only reason we gave this a “maybe” is because of the randomness of the draw hands. But even that can be greatly reduced with foresight and good strategic playing. Doomtown can feel a bit overwhelming at first (lot’s of action choices) and requires a decent amount of time and dedication to really understand and enjoy it, which will probably turn away most casual gamers. This is a game that rewards you the more you play. With the awesome publisher AEG behind the game, you know it’s going to continue growing and expanding. Everything about Doomtown is right up a power gamer’s alley. It begs to be explored and mastered, and power gamers will want to prove their expertise and deck construction prowess as they challenge other gamers to epic shootouts to see who really will take control of Doomtown! Opening the box is very exciting. If you’re a fan of CCGs then you’ll be very pleased to see that there is plenty of room for the future expansions you’ll be adding! AEG has done a superb job at making every part of the game drip and sweat the western theme. The rulebook is excellent. The flavor text mixed throughout will have you smilin’ and talking’ like a regular westerner. You’ll get enough cards to make all four of the suggested decks and still have a bunch left over. There’s plenty there for you and your family or friends to have fun with deck customization. If you’ve ever gone to a game convention, you’ve probably experienced how nice it is to have an experienced representative teach you how to play a game and take you through a few rounds. Well… AEG has managed to pack a “representative” for Doomtown inside each box with their tutorial booklet called “Gettin’ to Know Gamorra.” For us, this was a lifesaver. Once you hit the High Noon phase the game opens up to so many possibilities that it can feel a bit overwhelming at first, but with the tutorial book you get to experience a bit of the game without needing to worry about decisions and rules. Based on how dedicated AEG is with the fans, community, events and competitions for their game Legend of the Five Rings, we’re confident they’ll be just as dedicated to Doomtown and its soon to be large community of fans and gamers. If you enjoy the western theme, and are looking for a deep game that will reward you the more you play, then Doomtown: Reloaded should definitely set your sights on. Doomtown: Reloaded contains typical mechanics features in deck building and card games. For starters, players form a deck of cards to use as a play hand and a gambling hand. The gambling hand holds, in the gambling phase, a mechanic almost identical to poker in that the player with the lowest hand rank goes first and collects the ghost rocks betted by other players. This initial gambling mechanic allows any player to potentially win the hand due to the outcome being luck based. However, the players have reaction cards that can alter the outcome based on the whether a hand is honest or cheating. This adds variety to the game so that this phase is not simply a draw and reveal stage. The upkeep phase and high noon phases give players the chance to build saloons and establishments to gain control points, move their dudes which are their playing pawns, add abilities to their dudes or initiate shoot-outs for territorial gain. The game enforces the behavior of fighting and establishing temporary alliances amongst players to avoid any player from having too many control points at the end of the high noon phase. The rules do not limit the amount of actions a player can perform during the high noon phase which can have its advantages and disadvantages. In a 2 player game, the flow of taking turns to perform actions becomes seamless as it is easier to keep track of the abilities of an opponent player´s dudes and the strategies said player is following. This immediately becomes more cumbersome in a 4 or more player game as the high noon phase now can span over 30 player turns. In some cases, players decide to not continue playing by passing or run out of playable dudes. This in consequence makes the game a waiting game where only a subset of the group of players are actively participating in the high noon phase of that day. Once all players have passed, the day is considered finished and the influence and control points of each player are counted. If no player has an amount of control points greater to the amount of influence points of the individual sum of the dudes of each player the game continues. If the opposite happens, the game is over. These winning conditions while simple to achieve are difficult to attain when multiple players are in-game. At the end of each day, a significant amount of time needs to be taken to compare control points and influence points for each player. Though the high noon phase in its entirety feels long with multiple players, the shoot-outs are more interesting as players can aid others by adding their dudes to the targeted player´s posse. Having companions in a posse is favored because each dude grants an additional bonus to the drawing hand of the player. With these additional bonuses comes the risk of taking more casualties since every dude in a losing posse can potentially get a casualty. However, as in the gambling phase, resolution cards can turn the tables on the outcome which again brings a sense of variety to the game. This allows for players participating in a shoot-out to have, potentially, even odds of winning. Doomtown:Reloaded invites players to mix and match dudes of different gangs for further experimentation as these cards are paid depending on the amount of influence points the dude has. Adding dudes of a different gang make for more interesting combinations in shoot-outs as normal dudes can be combined with harrowed type dudes. A strategic example would be to use a harrowed dude to take casualties in a lost shoot-out since they take an extra casualty to be discarded. The game does not penalize the player for using both types such as in other card games where attacks can deal damage to characters of a certain type. Players who are in need of an additional bonus can choose to try and accomplish jobs to get ahead of the curve but these can only be won by a victorious shoot-out which is very difficult to accomplish in a game with multiple players. 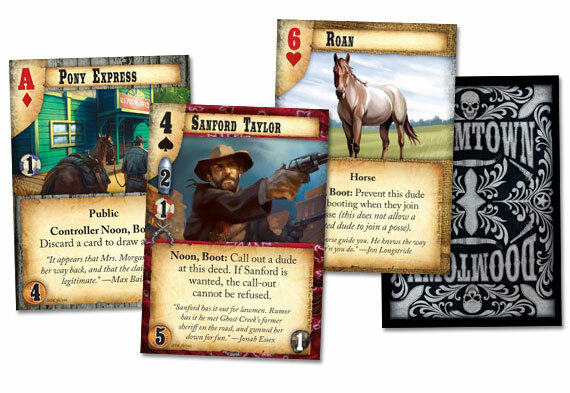 Overall, Doomtown:Reloaded offers players a wide variety of game mechanics to experiment with and a plethora of cards to build the ultimate deck. It sticks to its western theme by relying on the traditional gameplay of poker and the mechanics of calling out and initiating a shoot-out. Doomtown: Reloaded is a western themed collectible card game whose story depends on a clamoring settlement in the bizarre west called Gomorra. The story goes back to 1863 episode where a gathering of Native Americans attempted to drive out European settlers. The game permits two to four players to play at a solitary time. A regular game would extend up to 30 minutes while it can even broaden over two hours. The play gets extended if more players play the game. The whole play revolves around the possibility of poker, deck building, and region control. Based on the number of players, you set the game board representing the city of Doomtown with town square, home, and deeds. At that point you and your opponents would settle on the kind of faction they would play with. Factions shape the center of the diversion and accompany four distinct classifications. The Sloane gang represent the Outlaws, The Law Dogs represent the good guys, Morgan Cattle Co represent the ranchers, and The Fourth Ring represent a circus. Gameplay can fluctuate in view of the faction and the sort of deck you have assembled. The primary game travels through series of turns(Also, Called days). Every turn includes four phases beginning with the gambling phase where all players begin by placing a bet calling a lowball poker which decides the stream of turn between the players. I additionally enjoyed the possibility of in-game monetary standards called the ghost rock which helps me strategize my spending. This is trailed by upkeep phase where the player can pick ghost rock in light of the production value of his deed cards and can either pay for the upkeep of his dude cards or dispose them. Then comes High Noon phase which shapes the significant portion of the gameplay. Here, players can move their deeds or dudes, recruit new dudes, send a good to a dude, boot a dude or a deed or even take part in a shootout. The last period of the gameplay is sunset phase which can either decide a winner or prepare everybody for their next turn by refilling their play hand and unbooting all booted cards. The win state is decided by calculating the control points of a leading player versus the top influence points of other players. The game accompany seven distinctive kind of cards to play with. Spades are dudes who can be hired to play in the game. Hearts are goods that can be given to a dude. Diamonds are deeds which can be added to the side of your street. Clubs are events that happen arbitrarily in the town. Actions are unforeseen surprises that can be tossed at your rival. These actions are further isolated into Noon actions, Shootout actions and reactions. Advance, the deck can likewise have Jokers who are utilized like a trump card. The game can be played strategically by the sort of cards you move. On the off chance that the player begins by concentrating more on bringing his deeds then, it’s a guarded style of play. In the event that the player begins by concentrating on bringing his dudes then, it’s a hostile style of play. The most interesting component of the game is its combat situations. At whatever point you and the opponent hold a dude card in the same place(your home, opponent’s home or town square); You can call a shootout which is trailed by a poker hand. Another interesting thing while playing as a group is that you can match up with somebody and thump a player down. The quantity of cards to be utilized for a poker hand relies on upon your combat values which are calculated from the dudes participating in a posse. Regardless of how solid your rival is, the diversion can take a turn as the battle is totally determined by the fortunes of poker hand. Players go insane amid this time. This is the most extreme part of the game which can ace the dude cards who are taking part in the posse or boot them in view of the difference of the poker ranking(Casualties). The number of causalities is resolved from the distinction in the poker hand rating between two players. Advance, this poker rank can be modified if the player holds any resolution card to dispose of the opponent’s poker card or to increase his poker rank which makes the game erratic. The game components likewise accompany excellent aesthetics. The selection of pictures, shading mix, board style, visual data makes the game playable regardless of its mind boggling mechanics. Since the diversion mechanics are confused, it would take a while for a new player to get the hang of the game. However, once they understand, the entire play turns out to be exceptionally addictive. As players we begin envisioning ourselves as the general people in the old west firearm shoot setting. There is a lot of degrees for the game to develop in the coming years inferable from its multifaceted nature and addictiveness. Over the web, I discovered individuals requesting change for the manual, yet I feel AEG has did a great job in depicting each part of the game. My proposal for them is incorporate more faction cards which can add more variety to the gameplay. Generally speaking, I would prescribe this game with a rating of 4 out of 5. How about we shootout. Doomtown: Reloaded is the rerelease of the classic Deadlands: Doomtown. A CCG with a rich western, sci-fi design aesthetic, Doomtown sets itself apart by offering a deep gameplay experience with its intricacies in deck construction, movement, and poker hand rank resolution. Players fight for control of properties, or deeds, through shootouts between opposing factions and dudes, or characters. If you’re looking for game rich in strategy and can get over the steep learning curve, then you and your posse should have no problem fitting in the fictional western town of Gomorra. Doomtown is a beautiful game, hands down. The quality of the materials itself constantly gain praise in the circle of gamers. The cards are sturdy, handle well, and definitely outrank materials of more common TCGs like that of Magic: The Gathering. The core package was definitely meant to be purchased once, but enjoyed many times over. Doomtown is a game of control and resources, which also include the amount of play space required to play the game. Do not be fooled by the short stature of the play boards included in the core package, you will have to commandeer a play space of twice that to play comfortably. The art and graphics of the game in all materials are easily in my top three of “nicest to look at when waiting 20+ minutes for your opponent to finish their turn” games. That estimate is no joke, Doomtown can be a long game. With that in mind, let’s discuss the mechanics that make up Doomtown: Reloaded. Each player and their outfit, or faction, possess a fifty-two card deck. Composed of seven types of cards from characters to properties. Doomtown is a control based game with players fighting over deeds in hopes of collecting enough control points, denoted by a blue poker chip to outweigh their opponents influence, or the sum of their red poker chip values. Be prepared to keep the rules nearby just to keep track of the numerous numbers and their meanings on the crowded card faces as you will lose track. Doomtown is a game of turn based card play, with the first phase being an atypical round of five card lowball poker, where players ante and attempt to get the lowest rank. Following is the upkeep phase where characters and properties in play must be paid off to stay in play. The real meat of Doomtown play occur in the “High Noon” phase. Through a number of back and forth “Noon Play” turns, players put characters into play, maneuver them around the board, play event cards, and arm their characters to name just a few actions. This continues until a Shootout occurs, when a player “Calls out” another player and their character at the same physical location. A Shootout is Doomtown’s main form of combat, with poker hand resolution serving as the main mechanic. This continues back and forth until characters flee or the number of casualties equal the size of the posse, or either band of characters. It’s the shootout phase where the real strategy and action of Doomtown occurs. The variety in the numerous character abilities in Doomtown make for insanely interesting matchups and choices that the player must make. After the shootout, cards are reset and the game winning mechanic is evaluated. Do you have more control than your opponent’s influence? If so, you win this game of Doomtown: Reloaded! With all the above being said, the game is splendid if you give it time and understanding. There is one thing that makes it impossible for me to recommend Doomtown to anyone but experienced to expert board gamers. The game is complex and has a terribly high learning curve. From the numerous exception based rules and processes, the “In case you forget” warnings littered around the board, and the sometimes cryptic card faces with numbers, symbols, and confusing flavor text, Doomtown is not an easy game. Casual belongs nowhere near Doomtown as I can only recommend this to experienced and above board gamers accustomed to thumbing through manuals for an extraordinary amount of time their first couple games. AEG attempts to remedy this by supplying two starter decks in a custom order that matches a hand held walkthrough of the game. The tutorial however falls victim to the aesthetic, littered with flavor text and attempts to fit in with the theme that gets in the way of communicating the main mechanics in a clear and concise way. Doomtown: Reloaded is a game meant for those gamers looking for a complex, deep card game experience with an equally interesting aesthetic and style. A great value for the price also given that the core set includes quite the set of starting cards that allow you to dive into the complexities of Doomtown before asking you to purchase expansion packs to expand your repertoire. The replay value here is high, if you can stand the lengthy introduction. Doomtown: Reloaded is an expandable card game that is a reboot of an older collectible card game Deadlands. At a fundamental level, the objective of the game is board control. In the most basic sense the more board control you have at the end of a round, the more your chances of winning. 3. High Noon – This is the main phase of the game, where players can move their dudes around the board, play actions, spells, gadgets, goods and deeds. High noon is also the time in the game when shootouts can occur. 4. Sundown Phase – This is the last phase where the players determine how much influence and control they have on the board. 5. At the end of the sundown phase, if one player has more control than any other player has influence, they are the winner. If not, then another day begins. The base set comes with four “outfits” and the expansions let you add other outfits to your card set. Each outfit plays differently and have different sets of abilities that give them a distinct advantage when playing. The game has different types of cards like dudes, goods, actions, spells, gadgets and deeds. Deeds are properties which you can place to gain control points. The primary currency in the game is called “Ghost Rock”, it is what you pay to have dudes come into play and to keep them there. Ghost rock can be earned by acing dudes with bounties on them and during the upkeep phase based on the number of deeds you control. Shootouts are the game’s battle system using which you can try to get rid of the opposing player’s dudes. The reason I use the word “try” is because to win a shootout you basically have to win at poker. Each card in the deck has a playing card suite and value attached to it which is used in shootouts to determine the rank of your hand. Doomtown follows the traditional poker model for hands and adds one special hand of its own. The difference between the ranks of the players’ hands determines how many “casualties” the losing player takes. A turn can have as many shootouts as the players want, there is no limit. Jobs similar to shootouts except that the objective of a job is not to kill someone and you can initiate a job only if you have that job card in your deck. Deck building in Doomtown requires the player to consider multiple aspects of a card: its initial cost, upkeep, suite and value, number of bullets a dude has, whether a dude is a stud, the dude’s influence. As you can see, with so many intricacies involved in the selection of a card, there is a high possibility for players to develop a unique play style. The unpredictability of playing spells and gadgets also lends to the dynamic nature of the game. In a way similar to Dungeons and Dragons where outcomes of actions are determined through a dice roll, the outcome of a spell or gadget is determined by the value of a card drawn from the top of your deck. Shootouts to me standout as the most engaging element of the game, no matter how calculated your play maybe, no matter how strong your dude may be, there is still a chance that you can end up with a pathetic hand and lose the shootout; the opposite is also equally true. You can obviously stack your deck to give you good hands but the cheating mechanic ensures that you cannot exploit that aspect of the game. Doomtown’s convoluted set of rules will turn away many, but those who manage to climb that initial steep learning mountain will find a deep and satisfying game with enough freedom to create new types of play within the given ruleset. The game also scales to 3,4 and even 5 players. Though you might need to set aside more than a couple of hours if you are playing with more than 3 people. The creators have tried their best to explain all the rules in the rulebook and the learn to play book, this game still takes at least 3 play sessions to get acquainted with. If this game is not for you and you end up not liking the game, you at least have a flashy pack of cards to play poker with. Pick your faction, build your deck, and fire in the old west world! In Doomtown: Reloaded (2014) the objective of the game is to dominate as many control points as possible in the town of Gomorra through poker hands, shootouts, and special card abilities. Based on Deadlands: Doomtown Collectible Card Game from the ‘90s, this western expandable card game allows players to build their own decks of 52 cards to duel with other players. The purpose of this review is to briefly explain the game world and gameplay, but first there are a few things players should know in order to make the game more accessible. For one, it can take a while to get used to the “old western world language,” so spending time getting used to this vocabulary will help one to better understand the rules. Additionally, players should not immediately open the decks of cards and mix them together if they plan to follow the tutorial, as it requires players to use the cards in the packaged order. Finally, it’s a good idea to buy some card sleeves. The board can get so cluttered with cards that players can benefit greatly from an additional means of visual organization. Controlling board clutter is really important when determining what types of cards are in play, and most importantly, when determining victory. To win Doomtown: Reloaded, a player must control Gomorra by the end of the Sundown phase by having more control points than the opponent’s influence points. These points are included on certain types of cards. All cards have their own suit, rank, ability, and cost. Diamond suit cards (called deed cards – these are the playable locations) show the number of control points they signify, while spade suit cards (called dude cards – these are the game characters or people) denote the amount of influence points they include. But how does a player take control of a deed? In order to control an active deed, a player needs to move a dude into it, regardless of the deed’s card owner. The other two suits, hearts and clubs add nuance to shootouts and other interactions by bringing items and special actions into the game. Hearts are divided into goods and spells cards. These cards are used in shootouts and need to be attached to a dude to be active in the game. Horses, spells, and weapons are some examples of cards in this suit. On the other hand, clubs are called action cards. These cards are special events or powers that can be called directly from a player’s hand to take certain advantages, such as re-draw cards. Most action cards cost zero in-game currency, unlike cards of other suits. A player’s deck includes one gang’s outfit card, also known as the home of the player. Doomtown: Reloaded offers four different outfits for the player to choose from, each one with a certain amount of in-game currency to start with: The Law Dogs (the “good” guys), The Sloane Gang (the “bad” guys), The Morgan Cattle Company (the businessmen), and The Fourth Ring (the circus freaks). Some dude cards are related to their outfit cards, and some are not. Dudes that belong to a different gang than the outfit the player has chosen must pay extra in-game currency to keep them in play. Last but not least, there is also a joker card that can be built into a deck to be used for pulls and draw hands only (poker decision situations, representing any card – value and suit – the player wishes). By now, the essence of each suit in the deck is understood, as well as and that deeds and dudes. But that is not all – each card also has a cost in order to be played (except most cards in the clubs suit, as stated before), and some of them also produce in-game currency – known as ghost rocks – in the Upkeep phase of the game (which will be explained further). Besides that, dudes, goods, and spell cards also have a fire-power related to them broken into silver (stud) and copper (draw) bullets, increasing the chances of the player to build a better poker hand for the shootout by drawing or re-drawing extra cards. Knowing the information on each card is important for deciding on actions the player can take. A player’s deck is always faced down, and cards are drawn from it to use in two different hands. The play hand uses mostly the card abilities and the poker hand uses only the suit and rank of each card. Each player also has a face-up discard pile, an “aced” cards pile called boot hill (these cards are permanently removed from the game). A player can place a card in the game field vertically (meaning that it can still use the special ability and move/have an action) or horizontally (meaning it used the special ability already; this is called booting the card and it cannot make extra moves or call a shootout until it becomes “unbooted”). If a player runs out of cards, the discard pile is reshuffled and used as a new deck. The game cycles are divided into four phases. The Gamblin’ phase decides which player goes first in a round, and is determined by a lowball five-card draw poker game. In the Upkeep phase players collect the amount of ghost rocks on their outfit card and possibly deeds, gather production cards, and pay for the dudes in play. The High Noon phase is used to make moves in a turn-based system for each action, starting with the Gamblin’ phase winner. During this phase, players can call a shootout, move, shop, and trade. Lastly is the Sundown phase, which occurs after all players pass in the High Noon phase. Players check to see if there is a winner by counting and comparing influence and control points. This phase is also used to draw and discard cards to complete the play hand and unboot all the booted cards from the High Noon phase. The game then continues into the Gamblin’ phase and continues until there is a winner in a Sundown phase. Even though there is a lot of information, rules, resources, and statistics to absorb, the game includes a board to be used as the game field and tokens to help keep track of variables. The board, called an example street, helps to organize the setup for the game, and has useful information, such as how to form a posse, move the cards from one place to another, decide the winner in a shootout etc. The tokens – called counters – come in different colors, numbers and textures, representing the ghost rocks currency, control points, influence points and extra in-game variation. Both board and counters are really helpful, but still don’t compensate for the amount of variables the player has to keep track of in the game. It can be really tiring to play Doomtown: Reloaded, and it doesn’t live up to the excitement of a “poker based collectible card game.” The old western chaos theme might grab the attention of consumers, but even the “western terms” used to create the game world are confusing and frustrating to new players. There is a clear need to build decks effectively in order to balance the abilities, its costs, and the poker hands (mainly because there are some cards with a special ability to punish “cheating hands,” which occur when there are double value/suit cards in a hand). This is certainly a game of patience in terms of learning. The odds of falling in love with it the first time playing it are really low, so it’s recommended to play at least three or four times before making a final decision on whether it is enjoyable or not. In other words, this game is not very accessible and is geared towards a certain audience of gamers. There are some interesting mechanics to deal with that can be really amusing – such as managing money to place cards, creating traps for opponents with the assistance of keeping hands secret, building a deck aiming to balance poker and play hands, or avoiding cheating hands. Overall, the mechanics create an exhausting and complicated system to play in, dragging with them the potential to be immersed in the experience. Alright partner, gather round and listen up; this here review is gonna give yeh the low-down on this here game, Doomtown: Reloaded. Now, before I get to layin’ out the details, I wanna’ address this here tone I’m-a usin’. It might chop yer craw a bit to have to listen to me yammer on in this ol’ west jargon, but it’s somethin’ that needs doin.’ Now, y’all probably know there’s a mighty strong western vibe to Doomtown, but this ain’t just fer show. Embracing that ol’ timey western theme is really important to learnin’ the ins and outs of this here game. Not only is this jargon used when explainin’ the rules, but it’s used perty extensively in the design of the cards and in the different phases of play. So if yeh feel a bit outta’ sorts, it’s best yeh get over that sooner than later, ‘cause yer gonna have to embrace it if yeh wanna enjoy yer time in Gomorra. First things first, Doomtown ain’t for the faint of heart. It ain’t no picnic. If yeh wanna really get to know this game, and get good at it, then yeh gotta put in the time. It’s gonna take quite a few playthroughs to really get the gist of what yer tryin’ to accomplish, let alone become the talk of the town. Doomtown comes with two basic rule books. One of em walks through the rules of play, outlinin’ the different card types, and layin’ out the law. It strays away from this here western jargon, so yeh can get to learnin’ more quickly. But I figure yeh can do that on yer own, that ain’t what a review is for. The other set of rules makes use of them two rigged decks you’ll find if yeh root around a bit in yer box. These second set of rules walks yeh through the first stages of the game in mighty strong detail, makin’ it easier for yeh to learn the ways of the weird west, as we call it in these parts. I highly recommend yeh make use of these two rule sets. Doin’ so should give yeh a perty good grasp of what needs to be done in order to wrest control of the town from the varmints yer up against. Speakin’ of them varmints, let’s take a look at the different outfits lookin’ to take control of ol’ Gomorra. There’re four main factions, each tryin’ to outwit the others. There’s the Law Dogs, yer basic good-guy, law-abidin’ folks. Next, yeh have the Sloan Gang, a pack of miscreants and outlaws lookin’ to get their revenge on civilized society. Third, yeh’ve got the Morgan Cattle Company, for yeh business-minded folks. Finally, there’s a mighty strange circus in town called The Fourth Ring. These’re some odd folks who dabble in black magic. Oh yeah, hadn’t yeh heard? Doomtown is set in an alternate reality which allows for folks usin’ magic and other strange oddities. Now the whole goal of Doomtown is to undermine yer opponents by wrestlin’ more control from them than they have influence over you. Let’s break that down a bit. Play progresses through a series of days, with a series of tasks yeh gotta’ attend to each day. Remember, the goal is to get the most control. Control is determined by the different Deeds that’re put up around town. Each new Deed is a new area to control. In order to wrest control of these deeds, yer gonna’ need some Dudes. The Dudes not only help yeh get the control yeh need, they also up yer influence. Each Dude and each Deed has a certain value of control or influence assigned to it. It ain’t rocket science to figure out yeh need to control the Deeds to win the game. Either that, or yeh need to off the other players’ Dudes in order to take their influence down a notch or two. Either option could do the trick, it’s yer task to figure out which method fit’s yer style. Whether yer sendin’ yer Dudes to sit around in other folks hangouts, or to cause some trouble, it’s most likely gonna’ end in a Shoot-Out. This is where things get interestin.’ Yeh’ll have noticed that yer cards not only have information regardin’ their use in the game, but each one has a poker value—yeh know, them diamonds and hearts and whatnot, with a little number or letter next to ‘em. The Shoot-Out is where them poker cards come in handy. When a Shoot-Out happens, the locals clear out and the folks doin’ the shootin’ form up into Posses. Then the talkin’s over, and it’s time to draw. The outcome is determined by drawin’ cards from yer deck and rustlin’ up the best Poker hand yeh can, hopin’ it’s better than yer opponent’s hand. Now the question is are yeh gonna’ play an honest game, or are yeh gonna’ hide an ace or two up yer sleeve and slip it into yer hand. That’s right, yeh could cheat, and cheatin’ might win yeh the game. ‘Course, yeh might face the consequences of cheatin’ if yer opponent has the skills to make yeh pay for it. Or maybe they got nothing,’ and yeh get away clean. Whatever the case, the highest hand wins, which could get real nasty for the loser. After winnin’ enough of these Shoot-Outs, yeh might just have enough power to wrest control of Gomorra for good! As I said, Doomtown ain’t no walk in the park. That there was a perty basic run-down. It takes time and patience if yeh really wanna’ understand what’s goin’ on. It’s perty dang intricate, in fact. Yeh’ll need to experiment with yer deck, and figure out the different factions and card combinations that work best for you. If yeh take the time to do this, Doomtown can be a mighty excitin’ time. It’s a game that requires cunnin’ and strategy. Its ol’-west theme is represented in the art style, game design, and game mechanics. At first it may seem a tad gimmicky, probably like this here review, but as yeh get more accustomed to it, it grows on yeh. What’s more, gettin’ the hang of the theme helps folks get the hang of the game overall. Despite its complexity, Doomtown is a mighty fine game, and one that any real gameslinger will add to their collection. Gamorra, a weird west town, always has its arms opened for those who seek the biggest bounty. You will find an interesting rabble of sheriffs, bandits, mad scientist, and even psychotic clowns moseying about the town, vying for the control of Gamorra and the bounty of*ish Ghost Rock. Boomtown Reloaded is an expandable card game that can be played by 2 or more players. The winner will be decided by who has the most strategic mind and more importantly has lady luck on their side. It is all about taking control by using the player’s dudes to build up influence. Doomtown is immersive where players have the opportunity to build the town, making income, hiring dudes, and taking over their opponents’ property with their pre-built deck. It is also full of twists and uncertainties because of its unique mechanics combining poker and chess. The game adopts the basic poker game rules of drawing cards and comparing hand ranks. However, unlike poker, Doomtown allows cheating hands (though it gives you disadvantage against some abilities). This unique mechanic gives players more freedom when they are building their own deck where they don’t have to focus as much on the suit and number of a card but paying attention on the ability of the card. Each round marks a new day in Doomtown, which starts with gambling and ends with the Sundown Phase. One of the most important and dramatic phases is the High Noon Phase. This is the time when players take actions, positioning and taking control. Like many other western games, Doomtown has shootouts with its unique mechanics: combining playing cards and poker. This is where the game becomes interestingly complicated. It is not only based on luck but how the player built the deck as well since the player can use abilities to make twist based on the result from the current draw hand. In the beginning, this action can be really overwhelming since the player is not as familiar with the abilities. However, it is also these abilities that make the game more engaging since the system not only requires players being fully aware of their situation and taking actions strategically, but also creates uncertainty of the result that can completely change the situation one is in. One may argue that shootout is the most important action during the High Noon Phase. Indeed, it directly determines the number of dudes each player has, which affects his/her control compared to others’ influence. However, when you are fully involved into the game, you will realize moving your dudes is also as important if not more important than the shootout itself thanks to the booting mechanics in the game. Booting is like a cost in Doomtown, without paying any currency to use some awesome abilities. Players’ dudes have to be booted moving to a non-adjacent spot. This rule forces players to carefully move their dude so that when they have to answer a call-out, they don’t have to form their posses by booting every dude they have. Now, the game sounds more like chess, does it not? Doomtown Reloaded is an awesome game for those who enjoy wild western board games with poker mechanics. It is still great for those who love the settings and are familiar with basic poker rules. However, it can be really overwhelming or even frustrating to those who are not big fans of poker. This is because the poker mechanic takes such an important role in the game where it directly affects gambling and shootouts. It can be double-edged. Adding poker rules into the gameplay makes the game unique by increasing the randomness from luck and allows dramatic changes in the game. At the same time, it can also distract a player who is not familiar with basic poker rules from the main game play. Constantly checking hand ranks while memorizing different abilities of each card is not a new-player friendly experience. Doomtown itself has a big learning curve for those who are familiar with poker, but for those who have to learn poker rules first, this game is just too much. I would definitely recommend this game to those who like exciting twists in highly engaging and brain burning games. However, to those who are just ok with the settings and not familiar with poker (or even chess, like myself), I have to say that Doomtown Reloaded is a game that takes a lot of time and patience to learn before you can enjoy and master it. Doomtown-Reloaded is a re-issue of the original game which was released in the 90s. The offensive strategy used in the game is through the “dude cards”. Each dude card has a particular influence value and bullet value (the bullet value and the type of bullet are used during shootouts). Using dude cards the player can attack other players and call them for shootouts. If the player decides to play defensively he can build his game by using the deed cards. The deed cards have a certain control value in them. Players can buy deed cards by using moon rocks (the in-game currency). The control value helps the player in winning the game. If the control value of the player is more than the influence of his opponents, he gets to win the game. The key is to strategize on building the control points and simultaneously think of attacking the opponent’s dudes or occupying the opponent’s deeds at the right time. The game has infused the mechanics of poker in it. The poker like mechanism comes at two stages in the game, the initial stage where the player is allowed to draw up to 5 cards where the player with the low ball gets to start the game. The other stage where poker is used is while resolving various events in the game – from shootouts to spellcasting. The shootouts in the game is a very short but intense event where a player draws 5 cards. Depending on the bullets of the dude card the player can draw more cards (in the case of a stud bullet) and choose the best of 5 among those cards or replace cards (in the case of draw bullets) where he can discard a card and take a new card from the deck. Each draw can produce up to 11 combinations. Each combination is prioritized and the winner of the shootout is the one having a higher priority combination than his opponent. It’s a tense experience because one tends to lose his important dude cards into the Boot deck if his combination resulted in causalities of the card. This happens if the priority of the player hand combination is two or more levels lesser than the priority of his opponent. Once the card is in the Boot deck, the particular card cannot participate in the game. If the priority of the card is one level lesser than the priority of the other card, he gets to discard his card into the discard pile. He can use this card later on in the game. The player can also decide what kind of deck he wants to build for the game, he can choose between either building a strong deck for the poker playable or he can think about building a deck which has a good combination of dudes and powers. There’s nothing worse than building a deck full of killer cards and then pulling a godawful poker hand during a shootout. So care should be taken as to how the player builds his deck to fill in both the needs in the game. Give the game some time, understand the complexities and convoluted set of rules, once you get a grasp of it, you will have one of the best board game experiences with its powerful theme and mechanics. The one good thing about Doomtown is it has a wonderful tutorial series which gives you a walkthrough of each phase of the game and helps you to some level in understanding the game. I recommend you guys to go and try out the game and I’m sure you won’t regret spending a few hours in understanding the game! Doomtown Reloaded is a multiplier, collectible card game that is a remake from an older game from the 90’s called Deadlands Doomtown. The game takes place just after the civil war, but history is a little different than what we are usually taught about that time. The South kept their sovereignty, California fell into the ocean, and the Sioux regain control of the Dakotas. **** has found a crack in the earth, and is leaking its monsters, and magic into the world. The world discovers a new super fuel called ghost rock which pushes technology to advance faster than we originally could. The game is focused on an old west town called Gomorra. Gomorra has boomed due to deposits of ghost rock found around the city, leading to flocks of all kinds of different types of people to flood to the town hoping to make it rich. But the town isn’t big enough for more than one person, and that is where the player comes in to the picture. Each player is vying for control of the town. How a player gains influence and control is up to them, but a player cannot win the game until a player has more control than each other player has influence. A player gets control by having deeds, properties in the town, and gets influence by having dudes, characters in the game, in play. There are four different outfits a player can choose from. The Law dogs, the Sloane gang, the Morgan cattle company, and the fourth ring. Each has its own special characteristics. For an example, the fourth ring tends to have better magical abilities versus the other three outfits. The game is separated into different phases that make up one day in the town. The game begins with the gambling phase where both players draw five cards. In Doomtown, the player with the lowest hand wins. The player that wins the first gambling phase gets to go first. Then comes the Upkeep phase. This is where the players collect their money from their deeds and pay their dudes upkeep. After the upkeep phase comes the high noon phase. Each player should have previously drawn five cards from their deck. During the high noon phase is when each player gets to make their moves. Each player makes one move at a time going clockwise. If a player doesn’t have a move to make, they can pass. Finally, the players end the day with the sundown phase where players get to see if anyone won the game, discard cards, and unboot their cards for the next day. The high noon phase of the game is brilliant. Doomtown has managed to create a game where a player can become completely unique in how they will take over this town. If a player chooses they can spend most of their time and ghost rock on developing deeds in the town to make them more ghost rock which also helps their influence. Another player may spend their time developing their dudes and calling out other players to shoot-outs. The game is open enough to give the players anatomy to choose and strategize how to pursue taking over the town. But, just like the old wild west, a player can still win on plain old luck. When players battle, or call each other out to a shoot-out the winner is determined by playing poker. The player with the best hand wins. This makes deck building interesting. In other deck building games, the player is mostly focused on creating the best combination of potions, spells, and characters, but in Doomtown a player may leave bad cards in their deck, because that card gives them a better chance at getting a good hand in poker. When a player chooses to use a card, they are forced to boot that dude. When a player moves their dude onto a deed they must also boot that card. This part of the game is tricky, and takes a lot of time to get comfortable with doing. A player can also use different action cards and spell cards to give talents or abilities to their dudes. They can also purchase goods for their dudes. All of which is used to make the dudes more influential in the town and game. If you are a patient person who loves collectible card games, then Doomtown is the game for you. But, if you are looking to jump right into a game, without having to take the time to study the design and rules of the game, then this game is not for you. The first time I played the game, it was difficult to wrap my head around the multiple moving pieces, and I became frustrated that I couldn’t just start playing. The second time I played, my opponent quit. He thought the game was too complicated rendering it not enjoyable. The game takes time to learn, and if you are not willing to put time into learning how to play the game it won’t be an enjoyable experience. The game has been compared to chess, and I would say that is accurate. The game moves slowly, and a lot of its strategy deals with the positioning of a player’s dudes. The first time most players play the game they try to play it too quickly and rush into shoot outs, only to find that it doesn’t work well for the player. A well designed game, that is enjoyable for the right type of player. The game executes on its theme, and maintains its promises of not gouging its players of their money for rare cards and super rare cards. Worth a try for any serious game player. Doomtown: Reloaded (Doomtown) is an expandable playing card game set in the fictional world of Gamorra. Gomorra is not your average wild west, it not only contains Wild West aesthetics, but also is saturated with aspects of magic, fantasy and steampunk. These additional elements enhance the world of Gamorra and make the game interesting, visually appealing and add an additional layer of enjoyment for those who play the game. Doomtown has the possibility of appealing to a wide player base thanks to its engaging setting and mechanics but there are some barrier which keep it from appealing to wide player base. There are several genres that have basic mechanics in common with Doomtown. While playing, the game felt like a mashup of Poker, strategy board games and TCG’s. It is very obvious once you start playing how Doomtown shares mechanics and rules with Poker. Poker hands are used to determine the outcome of duels in the game and are, generally speaking, ranked the same way in which poker hands are ranked. Doomtown expands on the Poker hand mechanic by letting the players use cheating hands. Although this can lead to some rather strange and powerful hands, it can be risky business using cheating hands. There are many cards in Doomtown that have ability to punish and opponent using a cheating hand. The game also bears a strong resemblance to strategy board games as you must carefully plan your moves and know when to attack, defend or flee. Doomtown also shares many characteristics and mechanics with TCGs. Cards have abilities and stats that are used in combat situations. They also use the tapping (booting) mechanic that many TCGs use. The object of the game is to control the board by capturing and control points. You do this by astringing influence on the control points using dudes (creatures/characters). This is accomplished by constructing a deck around one of four factions; Sloan Gang, Law Dogs, Morgan Cattle Company, and the Fourth Ring, each of which has their respective strengths, weaknesses, and play styles. These elements combined with the randomness of constructing poker hands (through card draws) makes for some interesting and rewarding gameplay. The suite of the card (Spades, Clubs, Hearts and Diamonds) determine the type of card. Spades are dudes (creatures), Diamonds are deeds (locations), Hearts are Weapons/Equipment/Spells, and Clubs are actions. The game takes place in phases where players are able to collect ghost rocks (currency) from their cards or pay the upkeep cost for cards they already have in play. Players are also able to move their cards around the board, challenge other cards to a shootout which the player on the receiving end can either accept or flee from. The victor of a card draw is determined by the rank of the poker hand played as well as the card abilities which can be activated by the owner or controller of the cards. While some of the mechanics of Doomtown will feel familiar to people who have played TCG’s, Poker or a variety of strategy based board games, the complexity of the game makes Doomtown fairly unfriendly and difficult to learn. This causes barriers for those who wish to play or would be interested in the game but are daunted by the complexity and the time requirement that must be put in to learn how to play. While Doomtown can be an engaging and fulfilling experience for those with and advanced understanding and experience playing board and card game. However, it proves to be frustrating and difficult to learn for those with a beginner to intermediate knowledge of board and card games. In conclusion I would recommend this game to anyone who likes challenging strategy games and has a decent experience and knowledge in card and board games and I would recommend that beginners stay away as they will more than likely get frustrated. Doomtown: Reloaded is a unique Living Card Game (LCG) that wonderfully succeeds in its ability to implement dynamic and smart game mechanics within a weird west theme. Based on the Deadlands: Doomtown Collectible Card Game (CCG) of the late 1990’s, Doomtown: Reloaded is set within the Deadlands roleplaying universe… Different from being a CCG, LCG’s… have a standardized starter deck that comes with the base game and can be played entirely without expansions. Expansions are occasional, and are also standardized – so two players that buy the same expansion get the same cards… The game itself requires two or more players, and once players are accustomed with the game’s rules a single game only takes around thirty minutes. Having spent nearly a week with this game, I will attempt below to impart some sound advice and knowledge about three of Doomtown’s most interesting and unique features in an effort to inform those looking into buying or playing this game. To begin the discussion on Doomtown: Reloaded, let me start by talking about the game’s various forms of currency – it’s first noticeable mechanic. There are three currencies gained and lost throughout the game: ghost rock, influence, and control… The interplay between these three currencies is one way in which Doomtown excels. The players begin with very little currency, and throughout the game the players build up the town and recruit more dudes – increasing currencies dynamically as the story expands. These three currencies develop depending on the playstyle and outfit (the main faction) the player uses to form their deck (more on deckbuilding later). A Doomtown player must constantly make decisions between spending ghost rock on recruiting more dudes to build a greater variety of influence, buying gadgets to improve the survivability of dudes, or buying deeds that will begin to accumulate ghost rock during the next round and provide the controller with control points… These three currencies must be wisely balanced and monitored with one-another in order for the player to be prepared for various scenarios and react intelligently. And while it is possible to rush your opponents at the start of the game and end up winning in less than a handful of rounds, a player is far more likely to succeed if they aim for playing the long-game and by focusing on growth rather than aggression. …Dude movement – the third unique mechanic – is fast and effective when the player has a plan, such as moving a dude from her home to support growing enemy forces near one of her deeds, or can be slow when the player is unprepared or too spread-out, such as a player trying to bring back her most tricked-out dude from an enemy deed to one of her deeds… Ultimately the player has to make decisive plans on where to send their dudes and keep them from getting too spread-out or else risk having them be picked-off one-by-one without the possibility of backup… mortality in Doomtown is ever present, and if a player’s navigation doesn’t complement their dude’s abilities or their outfit’s strengths she will surely be fighting an uphill battle – possibly even an unwinnable one. … I also want to mention the enjoyment of Doomtown deckbuilding. The base game comes with enough cards and outfits for four complete decks with over fifty extra cards leftover. Each outfit – the Law dogs, Morgan Cattle Company, the Fourth Ring, and the Sloane Gang – emphasizes a unique form of play within twenty outfit-exclusive cards… Using these initial outfit cards, the player has the ability to add another thirty-two cards to their deck to balance and complement these styles, or create unpredictable teams by recruiting members of other outfits at an added cost. In addition, since poker-playing within shootouts and gambling phases are a large portion of the game, the player must also take into account the poker value of each card in their deck. High-value poker hands win shootouts and jobs, but low-valued hands determine which player acts first during each round… Having played with and built-various decks, this balancing act is as rewarding as any other deckbuilding CCG or LCG for many reasons. First, the game employs wonderfully diverse card mechanics so that two different cards never feel redundant… These sorts of relationships are common during deckbuilding and make the act of participating in the Deadlands universe rewarding to those with a playful imagination. Also because the game is a Living/Expandable Card Game, all players have the same cards so long as they own the same expansions, which puts players on an even playing field so that winning a game can really come down to a player’s ability to construct decks (plus a healthy dose of luck). Doomtown is the best strategy board game I have ever played. Although it is super complicated for beginners, if we would spend time on patiently learning how to play the game, it would be super enjoyable. Certainly, it involves with a lot of actions, such as building, attacking, gambling, earning, defending, moving, controlling, shopping and so on. There are many things on the cards and there are also a bunch of variety players could choose to play depending on how well the players know about the game. On the card, there are suits and numbers just like normal poker, but each suit represents different things, spades are dudes, hearts are equipment, diamonds are deeds, and clubs are events. The number (blue color) on the middle of deed card indicates how many control points it has; the bottom left number indicates how much it costs you to bring it to the play; the bottom right number indicates how much extra coins/ghost rocks you get in each turn. The number on the middle of dude card indicates how many influence points it ha and it used to help to win the game; the number on the bullet helps players to win a shootout; the number on the bottom right indicates how much it costs player to keep the dude in upkeep phase. Unlike the most of other board/card games, in Doomtown, players need to move through four phases in order: Gambling, Upkeep, High Noon and Sundown. If you think that is a lot and it might take you forever to finish the game, you are wrong because in the Sundown phase we are supposed to determine the victory, if no one wins, then a new day starts. Since this is a board game or a card game, the most important factor that determines how powerful you are is how you do to your deckbuilding. There are a ton of cards come with this game, in other words, there are a ton of ways to building your own decks. For instance, you will need to have ranch cards like “Blake Ranch” in your deck so that “Max Baine” could utilize his ability. I found it so interesting to do the gambling in gambling phase. Just like how we gamble when we play poker, there are different sets of poker hands to determine who wins the game. However, it is kind of weird that the rule is that whoever has the lowest hand wins the gambling. Besides, there are so-called cheating hands where one that has two or more cards with the exact same suit and value. You will have to use cheating resolution abilities either from your hand or from an action card, otherwise you lose the gambling round. I would say Doomtown contains 80% of player’s strategy and 20% of luck. The 80% involves with how well you know about your deck that you build, what kind of strategy is the deck for (like basically attacking, depending or building, etc.) Because each dude or deed card has its own cost, to win the game you also need to make sure you have enough money/ghost rocks to get them into play and keep them as needed. Some cards might cost 0 ghost rock, but have no ability it just used to fill your board with a lot of dudes to psychologically scare your opponents. It’s almost zero possibility where players would have same strategies with same cards. So, before you play the game, you need to be sure what you will be doing. I say 20% of luck is because you don’t know what cards you would draw from the deck, in most cases from my experience with playing this game, you will not be able to draw the exact card you want, that is why you need to use your strategy to move your turns. The game could be going very fast if players are doing a lot of attacking actions, and it could also be going very slow if players would like to wait for attacking from their opponents and do the counterattack. So, once again, everything is pretty much about strategy and what cards you have in your deck. I believe that a more powerful deck of cards would bring more fun to the player. Doomtown: Reloaded is an expandable card game that is accessible to 2-4 players. Giving an overlook to this game, the game theme was set in the wild west, in the town if Gomorra around the year 1860. Each player can take a role in 1 of the 4 factions (The Law Dogs, The Sloane Gang, The Morgan Cattle Company, The Fourth Ring). Like other card games, Doomtown: Reloaded comes with hundreds of cards in the base set for players to build their deck with. Each faction has 52 cards for players to use. The game has 4 phases which I will explain more in detail in this review. Gameplay time is roughly around 30 minutes for Intermediate/Advance players. Keep note that this game has an extremely steep learning curve. It might take hours for new players to just learn the game’s basic mechanics. Once you learn how to play, the real fun begins. By starting the game, each player can choose a faction to play with. Each card set that comes with the faction has 4 different types of cards. Spades, Diamond, Hearts, and Clubs. Spades are referring to “dudes” in this game. It is the cards that players can hire to work for them and use for different purposes depending on the gameplay. The dudes have its own abilities and cost. Diamonds are usually location cards, referring to “deeds” in the game. The deed cards can bring players special abilities and advantages to the game. Each building/location has its own cost to build and income for players every round. Hearts in this game refers to “attach some sort of enhancement” to a dude. Either it is an item or a spell, it is something that can boost your dude’s ability. Clubs are action cards. The card itself has 1-time use abilities. Once it’s used, it will immediately be discarded into the discard pile. However, before using the action card, a player must pay the amount that is assigned to the card like the deed/dude cards. The gameplay goes through 1 day that contains 4 phases. Gambling Phase, Upkeep Phase, High Noon Phase, and Sundown Phase. Gambling phase, players draw 5 cards and the player with the lowest hand wins the gamble. It will the effect the game play order as well. On the left side of each player’s board, there is a chart that players can see the ranks of the cards that they just draw to determine who’s the winner. Upkeep phase is the phase where the player collects money, hire dudes, pay wages and build deeds. Players can regard this phase as a “setup” phase for the day. The deeds you build, the dudes you hire will dramatically change the gameplay. High noon phase is probably the core of this game. In this phase, players should expect some intense gameplay. In other words, this is the phase where all the card actions, dude/ deed action, excitement, disappointment happens in the game. Control points and Influence points are now being introduced to the player. Players can control opponent’s deed depending on the control points on their dudes. The higher the control points a deed has, the higher or equal amount of influence points the dude requires to have in order to take control. The players will take series of action to maneuver around the town, call out fights, gain control points. Then this leads to the sundown phase. This is the phase where players count the total amount of control points/influence point that they gain in the previous phase. A player who has the highest control points wins. However, if players have the same amount, new day starts and players will repeat the 4 phase again. To sum up with, Doomtown: Reloaded definitely brought to the player some solid gameplays. From deck building to strategic usage of each card, Doomtown: Reloaded did a great job on combining traditional poker card games to a western steam-punk card game. Pros for this game: 1. Great value for the content in the box. 2. Contains a sample gameplay tutorial. 3.Great card and ability design. Cons for this game: 1. Has a really steep learning curve for new players. 2. Keeping track of stats might be really difficult in this game. 3. Some terminology in this game might be confusing to people in different cultures. Saddle up and ride into the dangerous world of Gomorrah, where you’ll face up against treacherous factions, discover mysterious characters and magic, and have the chance to claim fame and rule over the Wild West! Doomtown: Reloaded by Alderac Entertainment Group is a Western themed deck-building strategy card game that provides a unique experience for players with its terminology, use of poker hands, and resource management mechanics. The world of Gomorrah is filled with unique characters, spells, and locations, all supporting the ever-immersive western style. Although the game may seem daunting at first with its array of western terms and complex phases, Doomtown: Reloaded offers exciting strategic mechanics that will challenge players and ultimately result in very satisfying victories. A large part of the learning curve can be attributed to the western themes terminology that is found throughout the entirety of the gameplay experience. Learning and memorizing these terms can take time, but make much more sense after a few playthroughs. A few notable terms are Boot (tapping a card), Dudes (characters), and Deeds (controllable points). Furthermore, the use of Poker terminology is used in specific phases and card suits are often referred to as well. Because of this learning curve it is recommended to follow the tutorial that the game comes with. The tutorial has two pre-built decks that walk players through one turn of the game, along with two play mats that provide card positioning and player tips. For a player to win in Doomtown: Reloaded, they must have more control points (controlled Deeds) than opponent’s Influence (Dudes) at the conclusion of the Sundown Phase. This is achieved with the use of several tactics that players will learn and become more effective with as they become accustomed to the game mechanics. Players must build their own deck and balance between different card types and suits to maximize their chances to win in different phases. On top of this, players must learn to manage their resources with the in-game currency, also known as Ghost Rocks. There are four phases in Doomtown: Reloaded. The first phase is known as the Gamblin’ Phase, which decides the player who goes first. The Gamblin’ Phase is based on a lowball Poker hand. The player with the lowest hand rank wins and gets to take their turn first. The second phase is known as the Upkeep Phase. This is the time when players collect currency (Ghost Rocks) and pay wages (or upkeep) to their Dudes (characters). The most interactive phase is the High Noon Phase, where players can make a variety of decisions. Players can initiate Actin’ (use a card action), Call Out (challenge an opponent’s dude to a shootout), Move (move a dude to a new location), Shop (play a card from your hand), and Trade (swap goods cards with Dudes in same location). Although complex, this phase is where the majority of player strategy is presented, allowing players to make strategic decisions and planning for future turns. The last phase is the Sundown Phase and its purpose is to check to see if any player has won. If not, then the game goes into the next day and the phases reset, beginning at the Gamblin’ Phase again. Each of these phases introduces players to unique interactions and encounters, and although complex at first-glance, they become much more intuitive after playing several turns. Doomtown: Reloaded is a very thought-provoking strategy card game that will push players to plan and build their decks wisely. The large amount of risk involved with each and every action really adds a sense of tension throughout the High Noon Phase and introduces players to cautious planning and execution. To begin Doomtown: Reloaded, I highly recommend the use of the tutorial which walks players through one day (each phase) of gameplay. This provides a basis for understanding terminology and details within each phase. Some of the terms could have been left out and more generic wording and phrasing would have sufficed (ie. The use of “Boot” instead of the more common term of “Tap”), but following the theme of the game world seemed more important to the developers. Because of the steep learning curve, this game is recommended for people who are experienced in deck building card games and perhaps not casual players since it will take several playthroughs to get the hang of the game mechanics. This learning curve though is what makes Doomtown: Reloaded such a rewarding gameplay experience; the opportunity to build your own deck, improve it over time, and claim territory in the wild west of Gomorrah. Before starting the review, I want to address the fact that I don’t play a lot of card games or board games, at all. So if there is anything that can be represented better using board game or card game term, please point it out and let me know. Thanks in advance. Now let’s get into the topic. Doomtown: Reloaded is a western themed card-based board game that also merged some poker culture into it. You are at the town of Gomorra, and you represent one of the four factions in the town. Your job is to use your resources to control the town as much as possible. This is not an easy game to begin with, and it is not a pleasurable game to play before you understand what is going on in the game, so if you are new to board game and card game, be prepared that the learning curve for this game will be rather deep. However, if you at least have some basic knowledge and experience about different board games and card games, this game will be relatively easier to pick up, you just need to remember some more Doomtown-specific terms and unique game flows before totally get the hang of it. Also, although this game is marked as for “2+” players, the recommended number of players for this game is 2-4 before everyone understands the mechanics of this game, otherwise it will take way too long to finish one game. This is a living card game with numerous additional packs available. However, in order to learn the basics of this game, the base set is more than enough. There are 2 packs of pre-built deck that represent 2 factions in the game, Law Dog and The Sloane Gang. It also comes with a lot of additional cards so if you want to play as the other two factions, you can use those cards to build your own deck. There are different kinds of chips that represent different items. Chips with numbers are Ghost Rocks, which is the currency in this game. Red chips are influence chips, blue chips are control chips and green chips are additional in case you want to mark something else. The base set comes with 2 game boards so technically 2 players can play using only 1 base set. However, if you want complete experience of every possibility, it is recommended that each player has its own set. It also comes with a rule book and a beginner’s guide that teaches you step-by-step how to play using pre-built deck. Although the guide is not crystal clear, it is pretty helpful for players to understand the basic flow of the game with the help of rule book. Never read the entire rule book before playing the game, otherwise you will be confused very quickly. This is the kind of game where rules don’t make sense at all until you actually play it. There are several basic terms you need to know before playing the game. As we mentioned before, “Ghost Rock” is the basic and only currency in the game, this is something you need in order to buy, gamble and keep. Outfit is the faction you decide to play as, and after deciding which outfit you are going to play, you put the outfit card on “Home” location on your board. Dudes are people you have, regardless of gender. You need them to perform different actions and eventually, win the game. Deeds are properties you have, you can buy them by spending Ghost Rocks and place them down on “Deed” locations on the board and they will generate profit each turn. Spell, action and goods cards are used as assistances for your dudes or your hand. Discard pile is the pile that you put your cards in that can be used later on as your new deck. Boot Hill (or Aced) pile is the pile that you put your cards in that cannot go back to the game until the entire game is finished (perma-death). The game is based on “days”, and each day has 4 phases: gambling, upkeep, high noon and sundown. Before gambling phase, collect the amount of ghost rocks you begin with and return the amount you need to pay for your dudes to bank, the place where you put all you rest ghost rocks. In gambling phase, each player antes up 1 ghost rock and draw another 5 cards as your gambling hard (don’t touch your play hand yet) to pursue a lowball according to hand ranks. The player with lowest rank wins this phase and takes all anted up ghost rocks. In upkeep phase, players need to collect the amount of ghost rock they earned from their homes and deeds, as well as return the amount that they need to keep their dudes back to bank. This phase is basically a financial maintaining phase; you can choose to pay your dudes to keep them on the game, or you can choose not to pay them, and they have to go to discard pile with all cards attached to them. Players will spend most of their time on High Noon phase as this phase will only end when all players choose to pass without any action. If a player chooses not to pass, then s/he could do one of the five actions in this phase: acting, which allows player to use one action card in the play hand or use an ability of one dude if the ability has the word “Noon”; moving, which allows the player to move one dude to an adjacent place without booting, or move to a non-adjacent place with booting, adjacency is indicated using green arrows on game board; shopping, which allows player to spend ghost rock to use cards from play hand; trading, which allows player to switch attached cards between different dudes if they control the same location together; calling-out, which allows player to use a dude to challenge one of other player’s dudes, if the other player accepts the call-out, then they will enter shootout section, otherwise the other player’s dude will run away and go home booted. Finally, in sundown phase, check whether any player wins the game by checking whether one player’s control points is more than everyone else’s individual influence points. If true, then that player wins the game, otherwise, the game enters a new day beginning with gambling phase again. This is the most time-consuming, attractive and challenging part of the game besides core gameplay. It is not an easy task to build a deck simply because you want to pick cards with most useful abilities to you but at the same time, you want to get advantage in gambling as well as shootout draw, which pursues lowest rank and highest rank respectively. It’s totally up to you whether you want to build a balanced or extreme deck. But eventually, after building and using a deck that suits your style, you can feel how rewarding it is and you know that finally it pays off. Since I barely played any board games or card games before, learning how to play this game is rather painful. I played with another friend with pre-built deck and followed the beginner’s guide and it took us more than 1 hour to finish it step by step. At that point we were still uncertain what we did in the past hour. Later, I played another game with 4 friends (yes, 5 players in total) and it took us 5 hours to finish that 1 game. It’s worth it, however, because we all learned a lot about how the game actually works from that game by reading rule books and explaining to others constantly. I played a few more games after that with 3 or 4 people and it took significantly shorter time to complete those games. So try to learn as you play instead of learn before you play. You will learn much faster this way. If I have to give a grade out of 10 for this game, my answer would be (at least) 8. I took two points off because once you understand (at least most of) game rules, it will become one of the most addicting games you have ever played, but that deep learning curve certainly slowed players down quite a bit from entering that stage. This game is fun because of its extreme complexity as well as the fact that luck is sometimes important although it’s a skill based game, but it also turned many people away. Double-edged sword is just that paradoxical sometimes. That would be only 1 point deduction. Where’s the other point? Art style is fantastic; game rules are complicated but solid; deck building is strategic but rewarding. However, the tutorial, also known as beginner’s guide, could be clearer. Yes, it tells you exactly what to do for each turn, but it doesn’t always explain why, which constantly makes the player confused. No one likes to play with tutorial and doesn’t know what s/he is doing. Overall, this is a superb game that I recommend to all people who like strategic games as well as challenging games. I promise you won’t regret. Gather up a few friends, take your time, play with them, argue with them, learn with them. Trust me, you will learn much faster than you expected. Doomtown: Reloaded is a western, sci-fi collectable card game with unique poker and playing card elements. The game is a 2014 reboot of a Deadlands card game companion previously called Deadlands: Doomtown and was released in 1999. The game centers around controlling a fictional western town called Gomorra through playing and maneuvering ‘dudes’ around the town during the day or ‘High Noon’ phase. Also during this phase, players can build structures around town (deeds), upgrade dudes with weapons or equipment or play certain action cards. At the end of each day, if you control more of the street than your opponent has dudes, you win the game. Of course, in true western style, if you want something of someone else’s, you have to take it through a shootout. Shootouts are resolved through poker hands drawn from the same deck of cards as your dudes, deeds and equipment as every card in the game has a corresponding playing card value. There are more elements to the game but I’m not going to go much further because we might be here all day if did. Let’s address a huge problem with this game first; it has a huge barrier of entry. This game will take upwards of 3-4 hours of playthroughs to even begin to comprehend how the game should be played and how a deck should be built and that is coming from someone experienced with CCG’s and board games. Games which take longer than one play session to truly understand only lead to isolated and elitist gaming communities and Doomtown is definitely up there as one of the worse culprits. In order to combat this, the game does come with all you need to play in one box along with a “Learn Doomtown in one turn” Beginners guide. This beginner’s guide is somewhat helpful but as with all of included educational literature, takes several rereads. If you are committed enough to learn the game you discover a Frankenstein’s monster of patched together game elements which don’t necessarily make a bad game just a mediocre one. The slow development and movement of dudes around the board does create a pensive, strategic feeling which will feed all of the chess and go players out there. However, this is undercut by the randomness of the shootout poker hands. Imagine playing a fascinating game of chess with play-counterplay strategy, and just when you are about to execute a precise action to continue your grand plan, you must roll a dice to determine whether you can or not and you have somewhat an idea to play Doomtown: Reloaded. There is no player choice connected to the random events after or during its occurrence resulting in frustrating play. Badly implemented randomness undercuts the players desire to strategize and really only incentivizes having the best cards on the board at any given time. This is made difficult when you realize you are discarding huge numbers of cards every time you have a shootout due to the poker hand mechanic. A player can realize they have lost when they see that included in the poker hand they just played is the perfect card to react to the current board-state and now must wait until that card is recycled if ever again. This all leads to the game’s result always being defined by shootout poker draws and more often than not, just one or two specific ones. The resolution of combat through poker hands is a novel concept and at times when you know your approaching one of the aforementioned game defining shootouts players will feel a sense of excitement. However, these moments are too weak and infrequent to argue Doomtown is one of the premier CCGs currently available. The biggest positive to take away from Doomtown is its experimentation for deckbuilding. By combining both the playing card element and card action, the player must consider not only how their cards are going to develop a win condition but also how they will play out in poker hands. This will challenge even the most experienced CCG deckbuilders in a fun and challenge way that this reviewer thinks should be experimented with further in future games. It is a shame Doomtown does not produce a better environment to play the creative decks that can be designed. All in all, Doomtown Reloaded is a good experiment in game design and well worth the look if you are interested in how new elements can be implemented into traditional game structures. Nevertheless, when stacked up against other CCGs on the market today; there simply exists better choices with less of a barrier of entry, stronger player communities and more exciting moments. At its best DoomTown is an imaginative immersive tale set in alternate version of the Wild West. The narrative is very much intact, presenting a masterful job of world building. Gomorra is a living breathing boom town that is detailed right down to the personalities who make up the outfits vying for power. DoomTown is a card game that is steeped in strategy and deck building. Players (between 2-6) make a bid for their associated “outfits” (four total, initially) to control Gomorra. This is truly where the language and writing of the narrative excels. DoomTown comes packaged with two booklets, “Gettin’ to Know Gomorra” and the second booklet “Rules O’ Play”. The “Rules O’ Play” functions as the mythos and ultimate guide to the rich lore of DoomTown right down to the thematic writing. In actuality the “Rules O Play” is an instruction manual which highlights the different modes of play, phases of the games such as “High Noon” and “Calling Out” while continuing to cover other aspects of gaming in a clever way that is akin to creatively using storytelling to make the gamer want to read and understand the rules and world. “Gettin’ to Know Gomorra” Is a walk through guide, helping the player along in some of the initial phases of the game, building a deck and outlining card placement. At its worst DoomTown is horrendously hermetic that will easily thwart anyone simply curious enough to explore Gamorra before you can say “I’m your huckleberry”. It can also be said that DoomTown is actually a card game twice. Once in the sense of card collecting and deck building. Second in that DoomTown employs Poker suits that run parallel to being the deciding factor to whether or not a game action can be taken or not. The complexity increases when the fact that the poker suits are rendered inert in that they mean the opposite of traditional hands won or held in Poker proper. For example, aces are equaled to a value of one so they are lowest values in pulls and hands. Along with this approach to card values “counters” such as “Ghost Rocks”, “Blue Counters”, “Red Counters”, and “Green” and “Black” Counters all operate at different capacities within the confines of DoomTown that have to be considered in addition to the current “hand” held by a player at any given time while going through the game’s different phases. The various properties of the counters range from monetary gain which equals mobility across the board allowing the player to interact with multiple activities such as paying a bounty or buying property, while “Red Counters” have to do with affecting influence. While attempting to manage all of those resources, deck management at this point is laughable. Arguably complex for a seasoned table top gamer, the numerous piles of cards that the player has to keep track of is bad comedy. Cards have to be specifically placed and sorted to comply with game mechanics. This includes moving across the board, “booting” and making certain cards playable during certain phases of the game. DoomTown is broken up into different phases over a series of days. from the showdown phase as well as draw or discard the allowable limit of a player’s hand. There is also a card functionality that a player must be aware off when traversing the board. advantageous in a way to anticipate these elaborate card placement systems. system. MAX TABLE SPACE REQUIRED. Doomtown: Reloaded is the refreshed version of original game Deadlands: Doomtown released on August 2014 by designer David Williams. Doomtown is an expandable card based game in which the win condition is determined by gaining more control points than your opponent has influence on it. This mostly means building locations and getting your dudes to hold them, or take them off your opponent and this all leads to a chess-like game of moving your dudes around the town of Gomorra and calling out the opposition into shootouts. The game has 4 factions which are part of the town, Gommora. Each player takes up a faction. The aim of the game is to control all of Gommora by a player using its respective faction. This is achieved by holding or ruling over the properties (or deeds as called in Doomtown) by a player. The more the player rules or holds over the deeds, the more control points it gains. There are 4 phases of the game: Gambling phase, Upkeep phase, High Noon phase and Nightfall phase. Player’s usually end up in a standoff, when 1 or more player tries to take over a deed. Or a standoff may occur when the player meet-up in a common area of Gommora, the Town Square. The standoff is the turning point of the game. From that moment onwards the game transforms into a-kind-of poker game. Depending upon the cards each player has put in for the standoff, the cards are taken and returned to the deck. After the same, the rules of poker take off. Every card has a standard card value and based on the kinds of dude in your shootout you will draw a number of cards from your deck and try and make the best five card poker hand. The better the hand more you have managed to outshoot your opponent resulting in an end to the stand-off. Once stand-off ends the player who win’s it takes control of the deed the and inflicts casualty points on the opponent which results in elimination of a card from the opponent’s deck. Deck building is a critical part of the game. The player can choose what sort of deck he needs to work in the amusement, he can pick between either constructing a solid deck for the poker playable or he can think about building a deck which has a decent blend of fellows and forces. There’s nothing more awful than building a deck loaded with executioner cards and after that pulling a godawful poker hand amid a shootout. So care ought to be taken regarding how the player fabricates his deck to fill in both the requirements in the game. The game also uses incurrency values called ghost rocks. The ghost rocks are spent by the player to enter dudes in the town. Ghost rocks also serve multiple uses like raising the wanted level, holding on to deed of an opponent captured by the player, spending it on order to enter deeds into the town. Some are also required to maintain certain dudes. Players typically center their deck on doing one thing great. There are numerous suitable objectives to browse. A few outfits are better prepared for a few objectives; for example, Blackjacks (the diversion’s fugitive pack) typically have great shootout details and other hostile capacities. The following are some prevalent deck sorts. Players may blend two or more sorts, for example, a shootout deck that somewhat depends on spells. the player as well as the opponent. Player expertise is subject to two vital parts in the game: first in the deck assembling part where player settles on the deeds, dudes and the special cards by going for a protective or a hostile approach and the shootout stage where the player chooses which with fellows to assault different fellows and catch deeds by breaking down the shootout cards. I think Doomtown offers a decent blend of poker and deck building amusements. Once in a while the game gets far too moderate for the most part when the shootout goes into a draw furthermore when the players are simply moving the fellows starting with one deed then onto the next to get away from the shootout. I think fortunes has an enormous impact in the game, particularly when shootout happens the players need to draw cards from the decks. 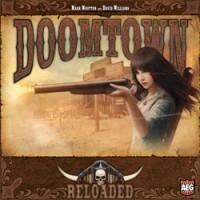 Add a Review for "Doomtown: Reloaded – Base Set"